Football is a dangerous sport. We know this. It can be even more dangerous before actual games when nobody is around and players are practicing and trying to get better. 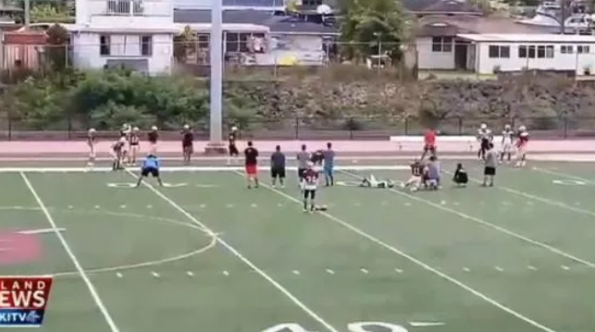 For Castle High School in Hawaii, somebody watching and recording just may have put to rest a dangerous drill a head coach had his players doing and had locals extremely upset. “A minute-long home video of a Castle High School football practice taken in July shows players lining up 20 yards apart, sprinting full speed toward each other, then violently colliding head on. It’s also prompting a new discussion about concussion safety. “This is prehistoric. This is not done anymore,” former NFL player Rich Miano said. He called the drill horrifying and dangerous. Castle High Athletic Director Laynie Sueyasu said the dangerous football drill was brought to the school’s attention and immediately addressed.